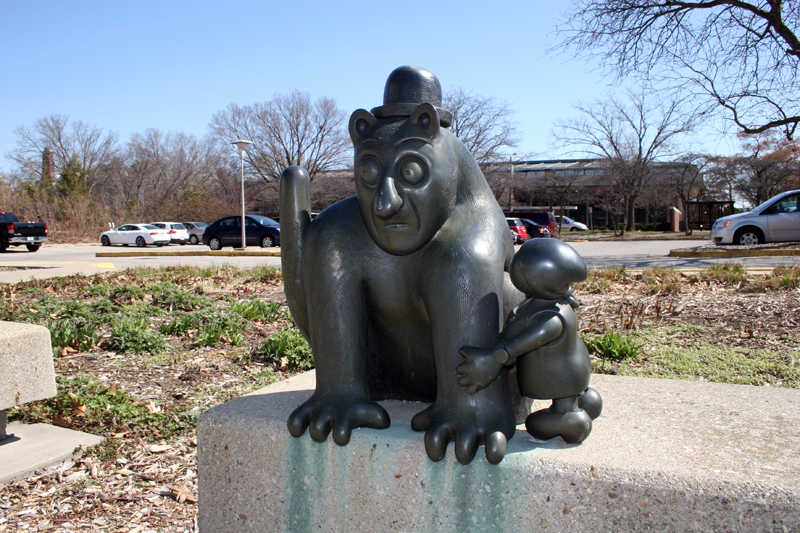 Artist Tom Otterness (1952- ) sculpted this piece, which is a bronze sculptural group of four units and various sizes. It was acquired with grants from the National Endowment for the Arts, the John Needles Chester Fund, the College of Fine and Applied Arts, and other sources. 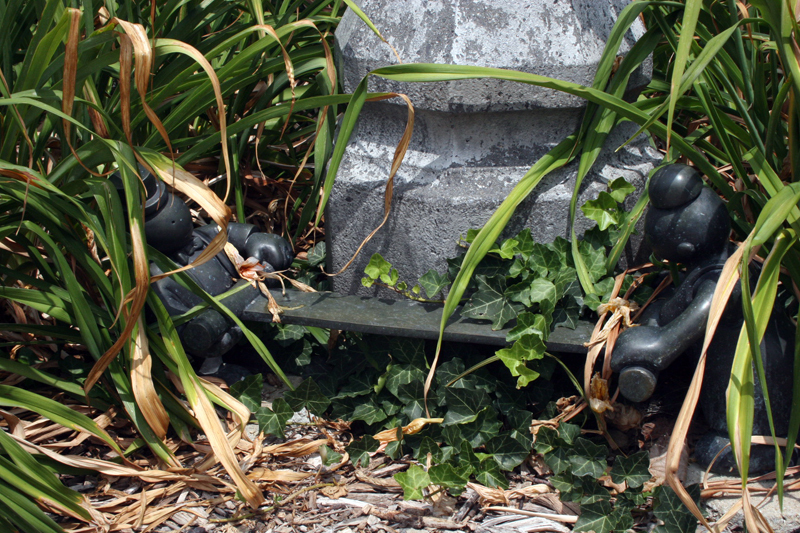 The artwork can be found in the Gelvin Garden of the Krannert Art Museum. This intriguing bronze group harmonizes perfectly with the other outdoor pieces placed along the same street: Basaldella's Initiation and Youngman's Centennial. All evoke a sense of archaeological discovery, of mysterious meaning, of civilizations unknown. Here the sculpture is an ensemble of four units. 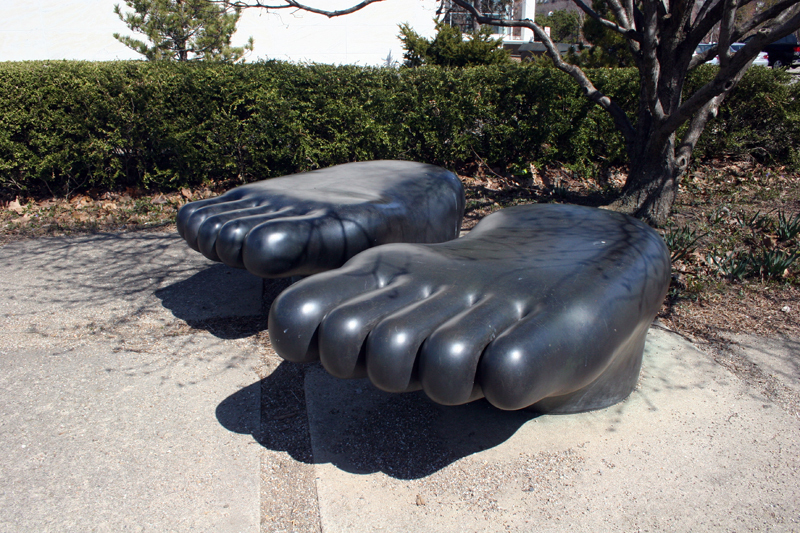 A pair of enormous upside-down stylized feet functions as benches. 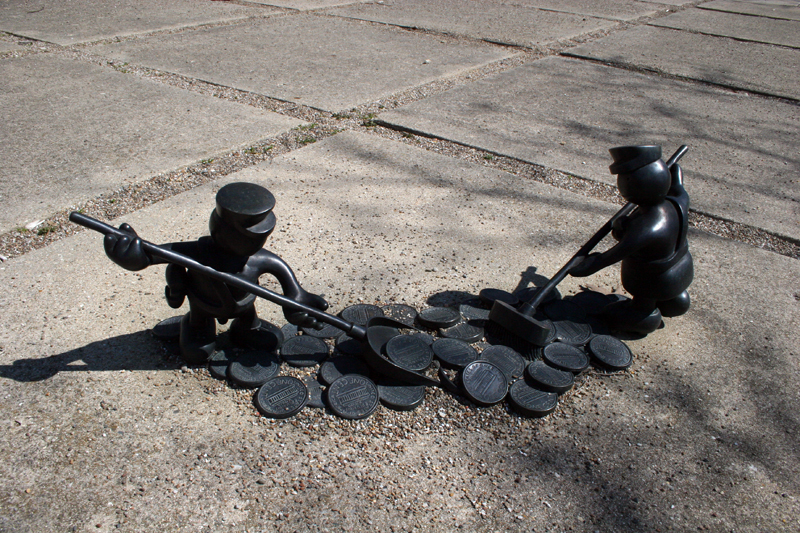 Two tiny, cartoon-like police officers shovel and sweep big pennies into a pile. An equally small couple in formal evening attire, holding a lumberman's saw between them, begins to cut down a real lamp post. And sitting on an real bench, a diminutive woman embraces an over-sized, bowler-hatted surreal cat with a strange human face. The bronze, burnished to a glossy sheen, possesses an unusually mellow blackish brown patina. Only the cat shows texture, with incised crosshatching covering its body. While the piece at first suggests whimsy and great fun, it imparts as well a sense of the sinister. Tom Otterness, the sculptor, intended it as a commentary on the human condition, what he referred to in his other projects as symbols or metaphors for society. Fascinated with partially submerged monuments and the idea that our knowledge of the past rests on fragmentary remains, he had trouble giving this work a suitable title-although he thought that something along the lines of "Submerged Society" might do. It will have to stay untitled for the present; it's like an artifact from another culture and viewers will have to figure it out for themselves. Otterness, born in Kansas, lives and works in New York City. His sculpture is in many public collections, among them the Brooklyn Museum, the Guggenheim Museum, and the Museum of Modem Art, New York; the San Francisco Museum of Modem Art; the Dallas Museum of Art; the Israel Museum, Jerusalem; and Museo Tamayo, Mexico City. This artist has been under controversy since the discovery of a film created by him in 1977 called "Shot Dog Film". The short, independent film, shows him adopting and then shooting a dog. In 2008 the artist issued an apology in the Brooklyn Daily Eagle, stating that it was "an indefensible act that I am deeply sorry for." Muriel Scheinman and Kara Brehm, “Untitled, 1991-1994,” ExploreCU, accessed April 21, 2019, https://explorecu.org/items/show/27.